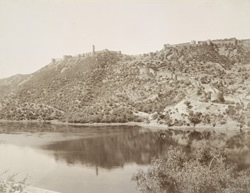 Photograph of a fort at Jaipur in Rajasthan, possibly taken by Gobindram and Oodeyram in the 1900s. The photograph is from an album containing views of various locations in India, formerly in the collection of Horatio Kitchener, 1st Earl Kitchener of Khartoum and Broome, (1850-1916), who was Commander in Chief, India between 1902 and 1909. Jaipur was founded in 1727 as a new state capital by Maharaja Jai Singh (r.1699-1743), head of the Kachwaha Rajputs. It was built on the site of a royal hunting lodge on a plain five miles south of Amber, the previous state capital. The city is ringed by a range of rocky hills to the north and east which were crowned with fortifications to provide retreats from its relatively exposed site. The chief defensive work was the Nahagarh or Tiger Fort (1734) built by Jai Singh to the north-west overlooking the city, and another was the Ambargarh Fort to the south-east. This is a view of one of the forts, probably the Nahagarh, and its ramparts from the banks of a lake at the foot of the hillside.